Get you groove on in the Dolce & Gabbana® Mediterranean Distressed Denim Skirt. Denim skirt features distressed patchwork throughput. Classic five pocket design. Belt loop waistline. Button and zip fly closure. Straight hemline. 97% cotton, 3% elastane. Machine wash cold, tumble dry low. Made in Italy. This item may ship with an attached security tag. Merchandise returned without the original security tag attached or a damaged tag may not qualify for a refund. Measurements: Skirt Length: 11 in Waist Measurement: 20 in Product measurements were taken using size 2T Toddler. Please note that measurements may vary by size. Get you groove on in the Dolce & Gabbana® Mediterranean Distressed Denim Skirt. 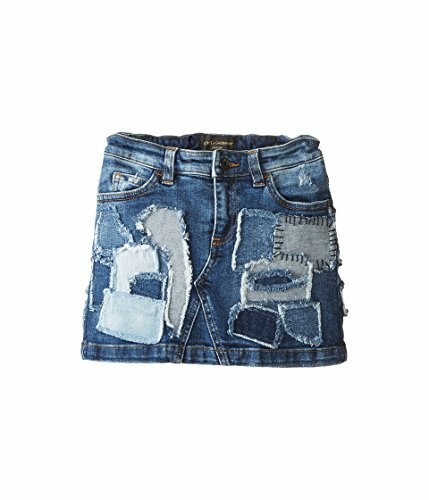 Denim skirt features distressed patchwork throughput. Button and zip fly closure. Straight hemline. 97% cotton, 3% elastane. Machine wash cold, tumble dry low. Made in Italy. This item may ship with an attached security tag. Merchandise returned without the original security tag attached or a damaged tag may not qualify for a refund. Measurements: Skirt Length: 11 in Waist Measurement: 20 in Product measurements were taken using size 2T Toddler. Please note that measurements may vary by size.